Any hopes that Oklahoma third graders would see improvements in reading proficiency this year were dashed Friday after results from the state reading test showed 7,970 students failed the exam and are at risk of being retained. Preliminary data from the State Department of Education shows 15.7 percent of third graders scored unsatisfactory, the lowest of four levels, on the reading portion of the Oklahoma Core Curriculum Test. That compares with 11.4 percent last year and is the highest failure rate in past five years. Officials attribute part of the increase to more special education students taking the Core Curriculum Test this year. Here’s a breakdown of how third graders scored this spring on the state reading exam. The numbers are preliminary. Note: A number of third graders did not take the test. That number is included in the total test takers used by state education officials to calculate percentages for each scoring level. Students who scored at the bottom level of reading will have to repeat third grade unless they qualify for one of six exemptions or pass an alternative test, such as the Iowa Test of Basic Skills, or unless the House passes a bill that also allows students to advance with approval of a team of educators and the parents or guardians. This is the first class of third graders to face mandatory retention if they score poorly on the reading exam. The results from the test show many students in the state’s largest districts, Oklahoma City Public Schools and Tulsa Public Schools, struggled on the exam. In Oklahoma City, 1,042 students, or 28.9 percent, scored unsatisfactory, and in Tulsa, 1,125 students, or 32.7 percent, scored at that level. Both districts have high rates of students from low-income families. Previous reporting by Oklahoma Watch showed students in poverty were most at risk of being retained under the Reading Sufficiency Act. Parents in many districts will find out next week if their children are at risk of being retained. The exact number of students retained won’t be known until later this summer, but state officials have said they expect about half will earn an exemption. “We want to reassure these students and their families that we will do everything possible to support the efforts to ensure they can read on grade level so they can have the earliest chance of promotion,” State Superintendent Janet Barresi said in a written statement. Oklahoma Education Association President Linda Hampton was critical of the state education department for releasing district-level results before parents were notified. She also said the state has failed to provide enough funds for reading programs and tutoring to help struggling students succeed. Tulsa Public Schools Superintendent Keith Ballard also criticized the state education department for its handling of the release of data. The timing meant the media had access to preliminary results before districts, administrators or parents did. “This was extremely disrespectful to our 9-year-old students and their parents, not to mention our teachers,” Ballard said in a letter addressed to parents Friday. The statewide results come despite concerted efforts to improve reading proficiency during the past few years. In 2008-2009, 6,698 students, or 14.1 percent, scored unsatisfactory. Nearly 6,018 students, or 12.1 percent, of third-graders scored unsatisfactory in 2012-2013. One factor in this year’s higher failure rate could be that about 3,000 more special education students took the state’s reading test this year, according to state education department officials. In previous years, those students took an alternative assessment. Statewide, 3,376 of Oklahoma’s special education students, or 41 percent, scored at the lowest level. It was not immediately clear how that compared with previous years. In Norman Public Schools, about 15 percent of the districts 1,119 third graders scored low enough to be subject to retention, up from 6.7 percent last year. The district attributed the increase to more special education students taking the exam. Nearly 65 percent of the students who scored at the lowest level on the exam are in special education or do not speak English as a primary language. The goal of Oklahoma’s retention law is to ensure students read well enough by third grade so they can master subjects moving forward. Opponents of mandatory retention say it can impede learning and social adjustment. Alex Weintz, a spokesman for Gov. Mary Fallin, said the state cannot continue to socially promote students who can’t read. Students who enter fourth grade unable to read will be unable to keep up in class, and will continue to fall further behind. Those students will then graduate unprepared for college and the workplace, or they will drop out of school. Amber England, government affairs director for Stand for Children Oklahoma, which advocates for school reforms, said Friday’s results are not surprising and highlight the need to change the existing law. Stand for Children Oklahoma and other state education groups are expected to gather at the Capitol Monday to urge lawmakers to pass HB 2626, which would create a panel of teachers, parents and reading specialists at each school or district who will determine whether a third grader should be held back or advanced to fourth grade. The bill is supposed to be given a floor hearing Monday. Even with current retention exemptions in place, England said the current reading requirement puts too much emphasis on the results of one test. Rep. Katie Henke, R-Tulsa, a co-author of the bill, tried to get the legislation heard Thursday in order to diminish the threat of retention before the release of this year’s test results. Meredith Exline, president of the Oklahoma Central Parent Legislative Action Committee, said members of her advocacy group hope to send a strong message to Gov. Mary Fallin and Barresi by showing up to the Capitol for Monday’s expected vote. Exline said the state needs to ensure that students can read before promoting them to upper grades, but added relying on test scores is not the best way to make decisions. Oklahoma’s read-or-fail law is based on a similar law implemented in Florida in 2002-2003. In Florida, about 43,000 third-graders, or 23 percent, scored low enough on the state’s test to be retained in the first year. 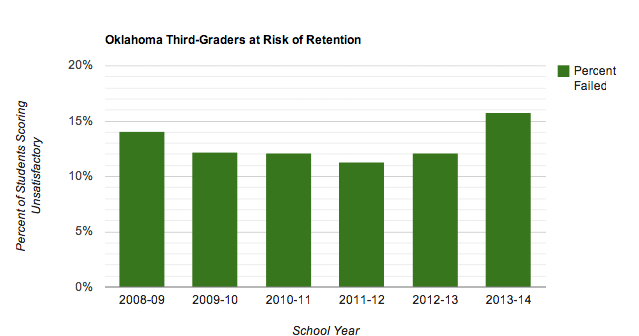 After exemptions were given to many students to advance to fourth grade, the retention rate ended up at 13 percent. In Florida, the percentage of third grade students retained declined steadily over years until a more rigorous test was put in place in 2010-2011. The share of students reading at grade level has increased. Oklahoma State Department of Education officials have said they expect to see similar trends in Oklahoma, with about half of failing third graders earning an exemption in the first year followed by an improvement in proficiency. Starting Monday, state education officials will take calls from parents, community members and educators about the reading-test results. The hotlines will be open from 8 a.m. to 4:30 p.m. Monday through Friday, through May 23. Parents, community members: (405) 521-3374. School district personnel: (405) 521-3301.